Here's How To Build A Chopper And Build The Custom Bike Of Your Dreams! If you want to learn how to build a chopper from scratch or put together a chopper from a bike kit, I have really good news for you. It's not as difficult as you might think. Here are some tips and advice on custom bike building. You should understand the basics of how a chopper (and a regular motorcycle) is actually pieced together. Jump in with two feet and build a custom chopper piece by piece. Build a kit bike first. This way you have all the parts you need and it will be a great way to learn how to build a chopper with less frustration. You will find out about your strengths and weaknesses, what you like or dislike in parts, and you will accelerate your learning for your next custom chopper built from scratch. You could build a motorcycle kit which is also known as a "bike in a box" and get all the parts needed in a single delivery; all you have to do is assemble the motorcycle. It sounds easy but it's not. It is definitely easier than building a motorcycle from scratch, and it will be a priceless experience. Share Your Custom Chopper Project Idea, Current Build, or Custom Part and Read About Other Projects Too! When you build a bike from the ground up you will need a wide array of tools including small hand tools, all the way up to a welder, a welding frame jig, and a lift table is ideal. But I know of home builders who make do with all kinds of household bits and pieces to get their bike put together; a wood frame jig, saw horses, and cheap welders. I know people who built their bike in their living room and kitchen. So anyone can do it. You just have to have the drive to get it done. And it's a fun experience. Before you build a chopper from scratch you may want to consider other alternatives to building a motorcycle. Because building one from the ground up can be a massive challenge for novice and intermediate fabricators (it can be done though). By the way you should get our free course on how to build a bobber or chopper (and avoid common bike building mistakes). 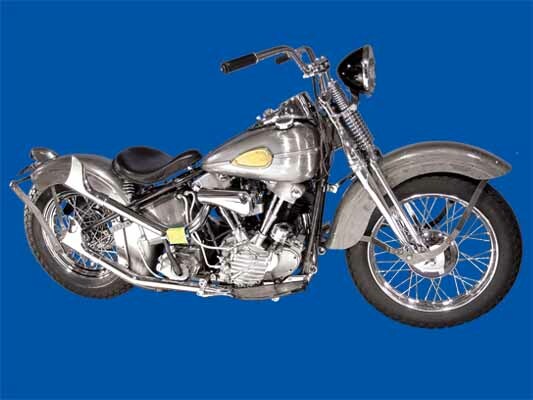 The alternatives are to buy a motorcycle kit, like the 1941 Knucklehead Bobber Bike Kit pictured above. This is one of the very few quality kit bikes available on the market. 5 - 10 years ago there were many motorcycle kits, but the recession wiped out most kit bike manufacturers. Custom Chrome used to have some really good kit bikes, but not anymore. The kit bike pictured here is really cool, and it's a quality piece of work. If you can afford the $23K price tag, then you might want to go for it. Building a motorcycle kit is a great experience. It's very similar to building a bike from scratch, except you get all the pre-made and pre-selected parts ready to put together. But it will also be a challenge, which is where you learn a great deal. Additional parts (you will have to ask the dealer selling the kit for a parts list). MSO (Manufacturer's Statement of Origin) - this is important and it should be give to you when you order. If it is not, then don't buy it. You get quite a bit with a rolling chassis like this one. All you need is to do the electrical, buy and fit the engine (which this one fits a FXST engine, 1984-1999 - an Evo engine), and get it painted. 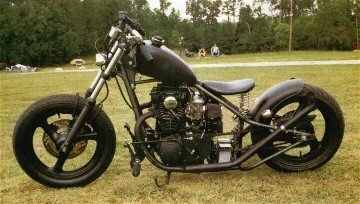 The third alternative to building a chopper is to buy a low cost project bike and chop it, or bob it, or customize it. You can accomplish this with tons of motorcycles. But some of the more popular bikes to chop or bob are the xs650 (like the one above), cb750, any Triumph, Harley Sportsters, Honda Goldwing, xs400, Vulcans, and many more. If you twisted my arm I would suggest you build a chopper from an xs650 because they are easy to chop or bob, fun, and have a good resellers market and after market parts market (same with the bikes listed in the above paragraph). Either way you'll need a tool that will help you save time and aggravation. Whether you want to learn how to build a chopper from scratch or build a kit bike, the little known custom bike building and metalworking techniques revealed only in the Covell Creative Metalworking videos and Michael Durham custom bike building videos are highly recommended for novice and experienced builders. Even if your a seasoned veteran of 40 years. With these DVD's at your disposal 24 hours a day, you'll build your bike faster and easier (whether you are a veteran builder or new to building a bike) because they will guide you through many of the nitty gritty details of the building and metalworking processes. 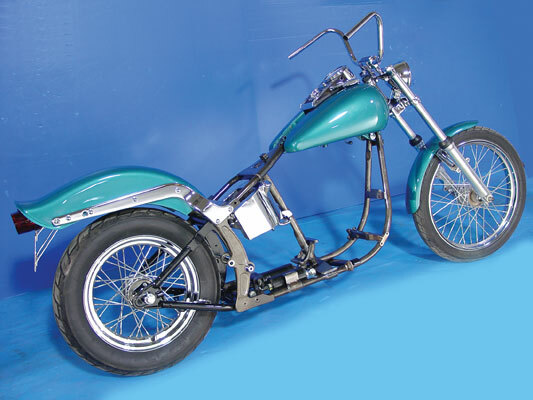 Also, if you are relatively new to the nuances of building custom motorcycles or don't have loads of cash to work with, read this information on building a cheap chopper: Build a cheap chopper. The second step...or baby step, is to read How To Build A Chopper Frame. It comes with a bonus report which will be a tremendous help in your bike building efforts. We also recommend this book: How To Build A Kit Bike, by Timothy Remus, Jonathan Wood. You can always save money, but saving time is more important. In other words you can always make or save money, but you can never get your time back. So going in prepared is very important. 'Tig Welding Basics' You have to know how to weld well if you want to work with metal. And this Tig Welding DVD By Ron Covell is touted as the best DVD on welding in the world. Discover new welding tips and secrets only master metalworkers know about! Click here for more information on this dvd and other Bike Building Guides!